The Siena horse race is not just a simple festival or event, but a distinctive feature of the city and its inhabitants. Let’s take a closer look! What is the Siena horse race? 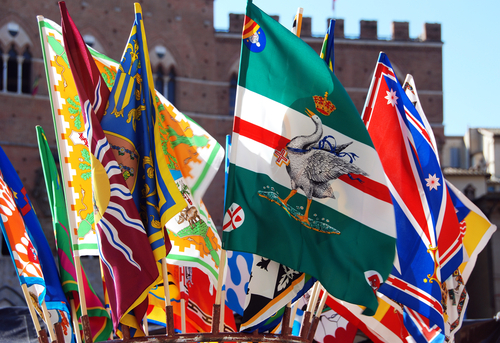 The Palio di Siena is one of the most famous horse races in the world. It’s held every year in the main square of the city, Piazza del Campo. 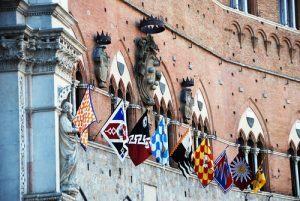 The dates of the Palio, also for this year, 2019, are always fixed on two specific days: July 2 and August 16. How does the Siena horse race work? The first recorded race dates back to 1633, and is where this tradition, so strongly felt by local inhabitants, began. 10 of the 17 districts of the city compete in the “carriera“, as the race is called: the 7 districts that did not take part in the previous year’s edition, and 3 that are drawn by lot to complete the race. The citizens of Siena feel a strong sense of belonging for their district, their neighborhood, so much so in fact, that it is easy to understand which district you are in at all times because they are decorated by their distinguishing banners and the symbols. 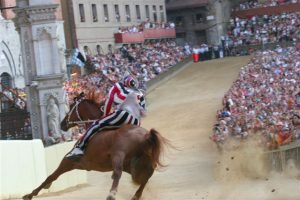 The Siena horse race lasts 4 days and the race is scheduled at the end. The first day is very important because it is the time of the “Tratta“, when the jockeys are assigned their horses, and then over the following days there are 6 trial runs. Even on the morning of the fourth day there is a trial run, but here the jockeys do not push themselves to the maximum to save the horses’ energy, for this reason the Sienese call it the “provaccia” (the bad rehearsal). Here we are, ready to go. The big day has arrived, and the whole city is in turmoil: the preparations begin in the morning, with the “segnatura”, or signature taking, of the jockeys that from that moment cannot be substituted by others. 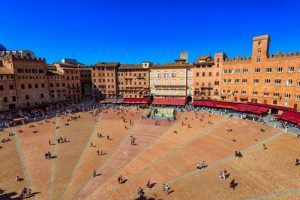 It continues at 3pm with a procession of 600 people in traditional dress that winds through the streets of the city and arrives at Piazza del Campo at 5pm. Then, 9 of the 10 jockeys are positioned with their horses on the Mossa, the space of the square delimited by two ropes, while the tenth comes in running to start this exciting race. The track is not simple, and not everyone can get to the end, some stretches are really narrow and inaccessible. The race is won by the first horse that crosses the finish line after three laps, even without a jockey on its back! The prize at stake, in addition to the Drappellone, is certainly the glory of the entire district, which is worth more than a thousand banners! Aren’t you curious to take part in the summer event of the city? Take a look at our tours in Tuscany! It is free to attend the race as a spectator, there are also paid seats with a better view, but everyone can participate and be immersed in the roar of the festive square. Why not take advantage of this unique event, you have a choice of two dates in the same year to participate. Choose the period most convenient for you, here at Dragonfly Tours we can customize your trip according to your every need to show you the most exclusive and the most characteristic features of the country. The jockey’s position on the starting line can help or worsen the outcome of the race. The districts pay the jockeys to run. There are no rules, ethical or otherwise, that prevent alliances between jockeys at the expense of other districts, is a bit of a game of cunning and strategy where the only thing that matters is to reach the finish line raising up the reputation of the winning district. This is why the race is so exciting!